She was a day tripper, one way ticket yeah! To find out, and I found out. Under the pressure of needing a new single for the Christmas market, John Lennon wrote much of the music and most of the lyrics, while Paul McCartney worked on the verses. Day trippers are people who go on a day trip, right? Usually on a ferryboat or something. But [the song] was kind of ... you're just a weekend hippie. Get it? That's mine. Including the lick, the guitar break and the whole bit. In his 1970 interview with Rolling Stone, however, Lennon used "Day Tripper" as one example of their collaboration, where one partner had the main idea but the other took up the cause and completed it. For his part, McCartney claimed it was very much a collaboration based on Lennon's original idea. 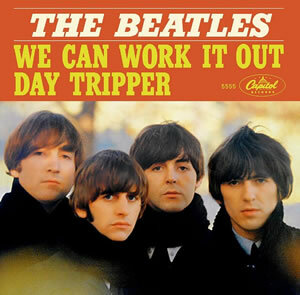 In 1966 McCartney said to Melody Maker that "Day Tripper" and "Drive My Car" (recorded three days prior) were "funny songs, songs with jokes in."